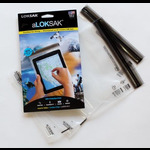 aLOKSAK is the only re-sealable, flexible storage bag offering protection from all of the elements. 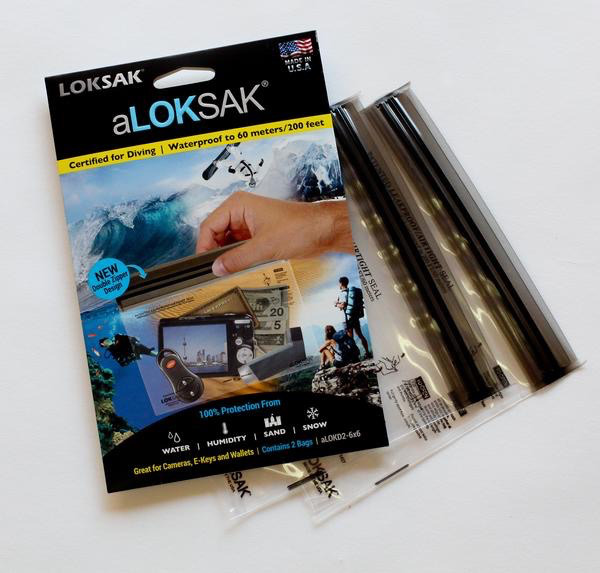 The patented, light-weight storage system prevents air, humidity, water, dust and sand from harming your valuables and electronics. 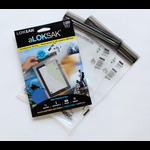 An aLOKSAK is indispensable for keeping your phone dry, to ensuring that your treasures are safe from the passage of time. They are also certified waterproof down to 60 meters and can be reused many times. Hermetic Seal – an absolute airtight seal preventing the re-entry or release of air and micro-organisms. Protects against microscopic particles like dust and sand. 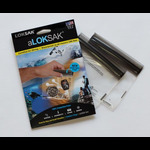 All touch screen electronics work 100% while protected in the aLOKSAK. Make and receive phone calls while phone is protected in aLOKSAK. FDA and NSA approved medical grade materials for food and biohazard storage. Comprised of a 6 mil patent protected new generation film. Dart impact ASTM method D-1709 typical value:>650 grams. Tensile strength ASTM method D-882 typical value: MD: 6,250 PSI/TD: 5,900 PSI. Waterproof up to 60 Meters. Durable 6 Mil film has a “Cold-Crack” tolerance to -40 C, far lower than that of PVC or vinyl. Inner dimensions: 16.19 x 13.34 cm perfect for kits, cameras, keys and other valuables. Dimensions 16.19 x 13.34 cm (inner) | perfect for kits, keys, cameras etc.